The (natural clinical) crown of a tooth is the portion of the tooth which is covered with tooth enamel and projects through the gums into the mouth. It is the part of the tooth you can see, as compared to the tooth root which is generally below the gumline. When a dentist mentions a “crown” as an option for repairing a tooth, they are talking about a prosthetic crown. If a tooth has been extensively decayed, chipped or cracked, and cannot be restored to its proper shape, function and appearance another way, the dentist may recommend placement of a prosthetic crown. Crowns are most often made in a laboratory by a skilled dental technician, and the process is very detailed. Use of computerized milling devices to make ceramic crowns is becoming more common, but they may not be appropriate in all applications. 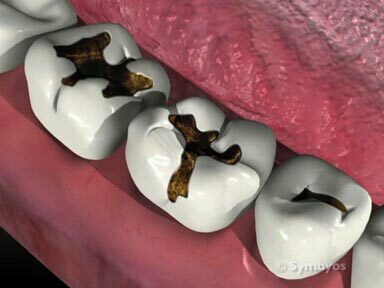 The tooth is first prepared for a crown by removing any decay, and filling in any voids. It is then reduced in shape to a tapered stump, which the new crown will slip down over. Crowns for baby (primary) teeth differ significantly from crowns for permanent teeth, from the shape of the prepared tooth stump, to the way the crowns are made and the materials they’re made of. When you have invasive dental procedures like crowns done, the dentist will review your health history. If you have replacement joints (for example, total knee replacement, hip replacement, etc. ), you may be pre-medicated with antibiotics for the procedure. If you have certain types of heart murmurs or replacement heart valves, you may also need to take an antibiotic pre-medication prior to the procedure. The following describes the typical crown preparation and laboratory process (if applicable) in detail. Your procedure may vary a bit from the procedure described. The tooth to be crowned is usually numbed by injecting local anesthetic around the nerve(s) that supply sensation to the tooth. Discomfort from the injection can be minimized by use of a topical numbing gel for a minute or two prior to the injection. Frequently, a preliminary impression (mold) is made of the teeth before they are altered. The material used most for crown impressions is polyvinyl siloxane, a dimensionally stable and extremely accurate elastomer (meaning it’s stretchy, but returns to the shape it takes when it cures after a minute or two). Other materials may be used. The preliminary impression can be made of silicone or other elastic materials. It can be used to make a temporary crown for the tooth while the final crown is being made in a laboratory, a process that can take a couple of weeks. If the tooth is to be crowned with a tooth-colored crown, a shade matching guide will be used to determine the shade of your natural teeth. The shade is generally matched in natural lighting, also called “full spectrum” lighting. Fluorescent lights can make teeth appear blue to grey; Incandescent lights can make them appear too yellow. Dental porcelains and resins available today can produce a stunningly precise match for the shade and optical properties of your natural tooth enamel, allowing a single crown to be made that matches your teeth nearly imperceptibly. The tooth is prepared by removing old restorative materials (if necessary), removing any decay, and (if necessary) filling in any deep holes or missing corners of the tooth. It may be necessary to place small metal (normally titanium) pins in the tooth to rebuild the portion of the tooth that will be covered by a crown. The dentist may use any of a variety of filling materials to rebuild the tooth, including composite resin, glass ionomer, and silver amalgam. Core buildups are considered a separate billable procedure from crowns. A distinction is made between buildups that involve all or a substantial portion of the core of the tooth, and those that require only a small amount of filling material in the core to build out a minor chip (called “basing to proper contour”). It’s a good idea to know in advance whether a complete core build-up is likely to be required, to avoid unexpected costs. The outer surface of the tooth is reduced in all dimensions (biting surface and sides) by 0.75mm to 3mm to make room for the crown that will be placed on the tooth. The walls of the preparation are tapered to allow the crown to be slipped down over the tooth. 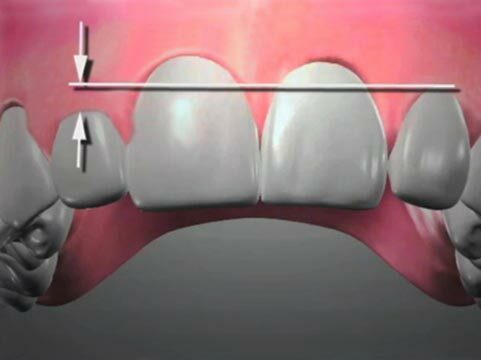 A ledge (margin) is created around the circumference of the tooth against which the crown will be tightly sealed. An impression of the prepared tooth and the teeth that bite against it is made, taking care to gently reflect the gum tissue away from the prepared tooth. Often, the dentist will place retraction cord in the trough between the gums and prepared tooth prior to making the impression. The cord will be removed after the impression is made. This technique allows the crisp outline of the prepared tooth to be recorded in the impression, so that a precise fit can be achieved between the crown and tooth. If the crown is not going to be made by a computerized milling device in the office (often the case), the impression that was made prior to preparing the tooth can now be used to make a temporary crown. This is done by filling the pre-impression with a gooey tooth-colored resin material, having the consistency of thick syrup, and placing it over the prepared tooth. The resin material will gel in about a minute (in the shape of the un-prepared tooth), and the impression can be removed from the mouth. The temporary crown completely hardens in another minute or two. Once hardened, it will be trimmed to proper fit, polished, and cemented onto the tooth with temporary cement. Solid ceramic crowns being made on a stone cast replica of the prepared teeth. Note how the teeth to be crowned have been reduced to tapered stumps (lower left and right frames). The crowns will be permanently cemented onto the stumps after they are evaluated for fit, function and cosmetic attributes. The impression of the prepared tooth and the teeth that oppose it is poured with lab plaster and allowed to harden. 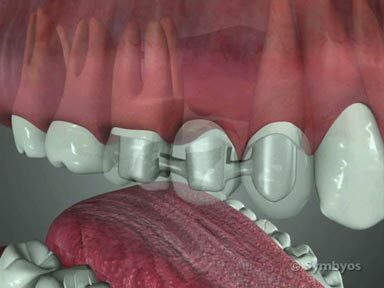 The stone casts of the teeth are assembled into a hinged jaw simulation device known as an “articulator” in their proper bite relationship. The cast of the prepared tooth (working die) is inspected closely for undercuts and any other irregularities. The technician will create a crown from wax using sculpture techniques. This wax pattern will be used in any of a variety of ways to produce the final crown, depending on whether the crown is to be made of ceramic, metal, or a combination of those. Full gold crown being made on a cast of the prepared tooth. Other materials, including various metal alloys, composite resin, and porcelain fused to gold, titanium or zirconium (a white metal), can be used to make crowns. Your dentist can help you decide which material is most appropriate for your needs. Depending on which type of crown is to be fabricated, the crown may be cast from a variety of metal alloys, pressed from ceramic, or made of ceramic fused to the metal alloy. Depending on which type of crown is made, it may require metal finishing and polishing, or other staining and glazing procedures (tooth colored crowns) to make the tooth match the patient’s natural teeth as closely as possible. discomfort associated with soft tissue management (gum retraction, etc.). The occlusion (i.e. functional biting relationship) of the crown may need to be adjusted slightly, and the crown re-polished. This should take just a minute or two under normal circumstances.